In the last lesson we looked at how long a moment is in falling. We found that a fall is made up of many micro moments. Being attentive to these micro moments, however, is dependent on developing comfort while practicing falling. Now let’s look at what occurs when we stop at stances on a route. When we stop, we need to rest and think. 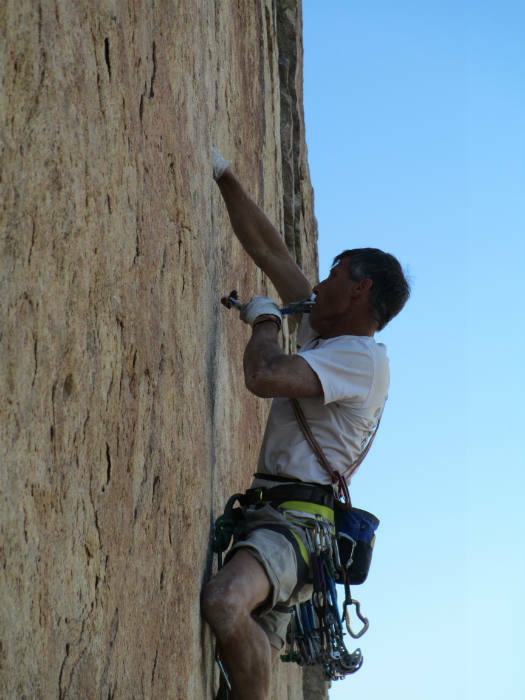 Many climbers think that when they stop they are just waiting to begin climbing again. They don’t realize they need to commit fully to resting. This passive approach makes them feel like they have no time and need to begin climbing again before they run out of energy. They also allow their minds to think of many irrelevant things like hoping they don’t fall, not wanting to be pumped, or wondering why their partner was able to climb the route when they are having so much difficulty. Their minds are full of thoughts that don’t help them assess the risk. Again, let’s keep this practical. To shrink the moment when resting we need to understand it as a continual process. Instead of relaxing into a rest stance only once, we need to “always be relaxing” into the rest stance. This prompts us to engage resting as a continual process so the moments that make up resting become active, tangible things we do on an ongoing basis. Breathe, breathe, breathe… relax, relax, relax… Practicing this creates more comfort in the rest stance and keeps us from feeling rushed. To shrink the moment when thinking we need to focus only on gathering information about the risk. We do this by using the Warrior’s Way Lookings Process. We look at three components of the risk: the end of the risk, the fall consequence, and our climbing plan. We create more comfort by practicing the Lookings Process. With our attention on continually relaxing and doing the Lookings Process we expand the moment. We don’t feel as rushed and take time to rest and think. In the next lesson we’ll look at moving moments.